Durban, 4 December 2018 - Today, Mr. Ohad Hatzofe, Avian Ecologist of the Israel Nature and Parks Authority, has been declared the winner of the AEWA Conservation Award. The Conservation Award for the individual category has been presented at a special ceremony on the opening day of the 7th Meeting of the Parties in Durban, South Africa. Ohad Hatzofe has been the Head Avian Ecologist of the Israel Nature and Parks Authority’s (INPA) Science Division since 2003. In this capacity, he has run all avian conservation programmes for the INPA in the following areas of expertise: conservation of species and their habitats, management of human activities, research and monitoring as well as education and information. His innovative solutions to threats faced by migratory waterbirds in Israel included nourishing pelicans and designing artificial nesting platforms for terns. He succeeded in resolving conflicts with people to support conservation of threatened species. Cranes were prevented from causing damage to local farmers’ crops – the cranes were fed with grain daily. He planned the translocation of cormorants’ nesting sites to eliminate conflict with fish farms. These measures have not only proved to be successful in terms of conservation but also attracted bird watchers. Ohad addressed unnecessary mortality of waterbirds and has proved to be an effective advocate of preventing the construction of wind turbine farms in inappropriate locations and the elimination of lead ammunition. Also, Ohad has been acting as Director of Israel’s nationwide Annual Waterbird Count since 2004. Finally, as a frequent interview partner for the media, he has contributed to enhancing public awareness for bird conservation. The Award is conferred every three years, at each ordinary session of the Meeting of the Parties and is presented in two categories: individual and institutional. The Egyptian Environmental Affairs Agency received the AEWA Conservation Award in the institutional category. 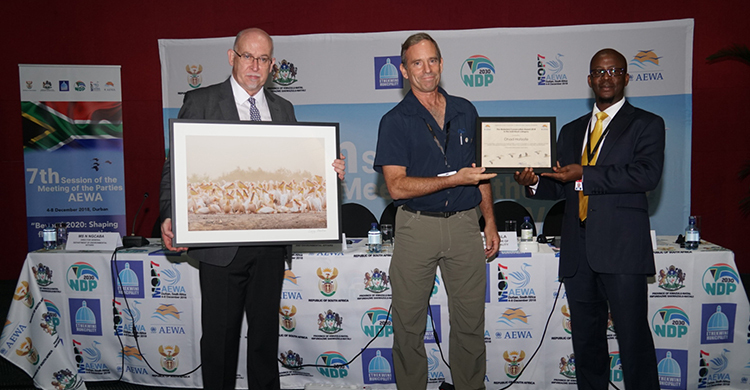 The AEWA Waterbird Conservation Award was established in 2005 by the AEWA Standing Committee to recognize and honour individuals, as well as government and non-government organizations and enterprises. Recipients should have made a significant contribution towards long-term conservation and sustainable use of waterbirds in the African-Eurasian region. The Agreement on the Conservation of African-Eurasian Migratory Waterbirds (AEWA) is an intergovernmental treaty dedicated to the conservation of migratory waterbirds that migrate along the African-Eurasian Flyway. The Agreement covers 254 species of birds ecologically dependent on wetlands for at least part of their annual cycle. The treaty covers 119 Range States from Europe, parts of Asia and Canada, the Middle East and Africa. Currently 77 countries and the European Union (EU) have become a Contracting Party to AEWA (as of 1 October 2018).